Wordpress Click Tracking - Who's Clicking Where? WordPress Click Tracking – Who’s Clicking Where? Have you ever wondered where people were clicking at your blog? Now you can track every click with the Click Tracking WordPress plugin. It’s designed to recored every click, no matter where it is on your website. Links, images, forms or just random spots. I tested the plugin on two different blog and have gotten the same results; nice click tracking but how accurate are the results? It seems that clicks are recored all over the place a not centralized on any specific area. 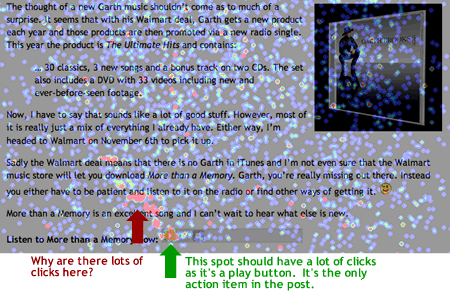 There are small hot spots, but not necessarily on top of a button or link. So, to have a hotspot without an action makes me wonder how accurate it really is. On the plus side, it is a free plugin and it can give a good overview of click data. I didn’t see a slow down in page render time either. So, whatever it’s doing, it’s not effecting the site performance. I also found it hard to track clicks on the homepage of the blogs as the content keeps changing. You can get an idea of menu items, but not the general content. It’s best to look at individual post pages for the best results. I think results will very based on a few different variables. If your site is a flexible width site, like the one in the screenshot above, it could account for some skewed data. Possibly if your page is centered in the browser window or not too. I’m not sure how the plugin accounts for content that’s not always in the exact same place for every visitor. It’s defiantly worth a test if you are interested in click tracking data. Give the Click Tracking WordPress plugin a try and see how your results compare. Click Tracking 1.0 beta2 was the basis of this review. I will definitely try out this plugin. it seems to be very interesting and we can track our visitors activity in our website.